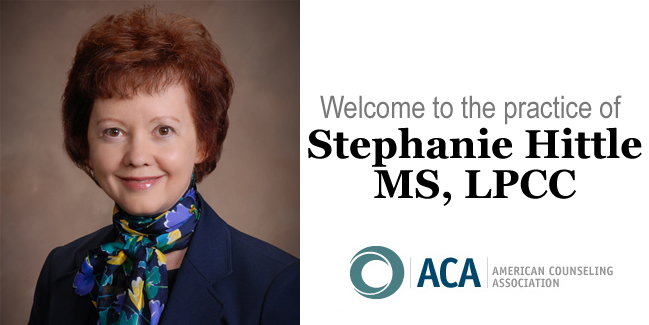 Welcome to the practice of Stephanie Hittle, MS, LPCC. Stephanie Hittle is a licensed professional clinical counselor in private practice in Centerville, Ohio. She uses a strength-based approach to help persons make positive choices and changes for their lives. Hittle has more than twelve years of experience counseling adults and teenagers and had a prior career in communications. She is also the author of numerous articles on positive communications, stress management, infertility, grief and loss and various aspects of mental health. She wrote a chapter for “Experiencing the Great I Am: Forty Faith-Building Stories from Contemporary Christians” and writes a column for medical professionals for Health Care Today, a publication of the Dayton Daily News. She is also a frequent presenter for religious, school, business and civic groups at local and state levels. She is a member of the American Counseling Association, Ohio Counseling Association, RESOLVE, the National Infertility Association, and the American Society for Reproductive Medicine. Hittle’s master’s degree in mental health counseling is from Wright State University. Her post-graduate requirements for independent licensure were completed through the University of Dayton and her undergraduate degree in communications is from Indiana University. Counseling Q & A: What can I expect from counseling? Most persons seek counseling because they want something to change in their lives. They may want to feel less depressed or anxious, learn how to handle problems differently, and/or improve their relationships. Counseling should give you a safe place to explore your thoughts and feelings and help you facilitate the changes you want in your life. Not everyone “needs” counseling, but nearly everyone can benefit from it. The more your problems impact your daily life, the more necessary counseling becomes. Besides, like physical health, with mental health the sooner you address problems the more likely you’ll have positive outcomes.